I almost forgot about blogging today until it clicked just before the light got bad, hence them not being the best photos I've ever snapped! I've been catching up on TV all day (lazy I know, but Call the Midwife is my favourite!) and doing the tedious task of sorting out my washing. I also finally got around to finishing up a playsuit I bought about 3 months ago with the intention of dying it black! I bought this dress on payday along with the blue one because as soon as I saw it I was like "that is a ME dress". The usual oversized smock style, printed with t-shirt sleeves. Just too perfect. I like the yellow as well as the blue, I think I'll probably be really naughty and keep both of them! Smack on the wrist for me! LOVE call the midwife! loved last nights episode! you look fab in yellow! I love this dress, I want the same ! That yellow colour is completely gorgeous. 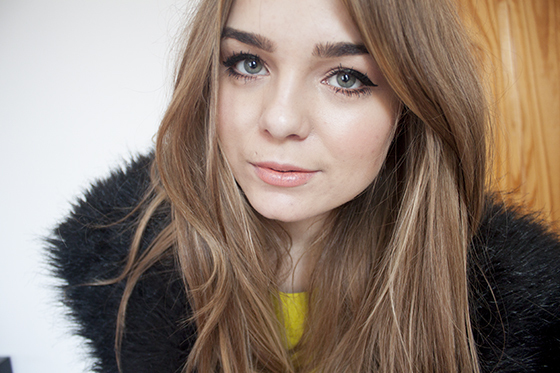 This colour suits you so much Lily, you're a right babe! Really cute dress and it suits you so well! I love this dress, the color looks fantastic on you! you look so lovely in colour! Yay, a pop of colour in my blog feed! Loving this look, reminds me that spring is actually a thing. You're so lucky that you can pull off oversized looking things so well! wowowow. i love love love colors on you! you look so amazing and fresh! Lily, you should wear yellow more often. You look radiant! Does anyone know if this is neon yellow or just a bright yellow? Love this dress. Getting realyl excited for spring/summer colors and clothes. Ready to shed all these layers. Lovely color on the dress, absolutely stunning! Cute! The yellow was totally unexpected. You awesome in it! I love this Dress its such a beautiful colour! Love Call the Midwife! Also I love your dress and also your bracelets - such a nice colour! reminds me soo much of spring! That is a such a great colour! I love how you've managed to keep it practical for the spring transition with the coat and tights! That dress is stunning! I love the colour, cut and style. I really don't blame you for keeping both, the blue is just so wearable but this one is such a gorgeous colour! Love this dress! It does have 'llymlrs' written all over it! So weird, I bought the navy version of this dress and as soon as I saw it I thought of you! Lucky you grabbed it as I think the navy's sold out now! Love the bright colour on you! That is a very you dress as you say haha. You hair looks lovely like that! Love the outfit! The yellow is such a lovely bold colour! The colour is so lovely! I really need to try to get out the habit of just picking up greys! adore that bright pop of neon, lovely to fight off the cold! You look AMAZING in this yellow, such a nice shade on you! Yellow looks so good on you! And I absolutely love your haircolor and style :)! That colour is fantastic. I definitely can't pull off yellow but it works on you! love your nails too! I love the yellow on you, but... I really love your hair!!! Georgeous. WOWOWOWOW, that colour! I'm already feeling more spring-like just looking at it! I love the colour of your dress. Perfect for Spring/Summer. This coloured dress is amazing! I usually just wear black/white/grey but i think may need to add a splash of yellow now. That colour looks amazing with the black and really suits your skin tone! I actually love this colour. Need to get some more of this colour in my wardrobe ! Lily, you look so lovely in yellow! 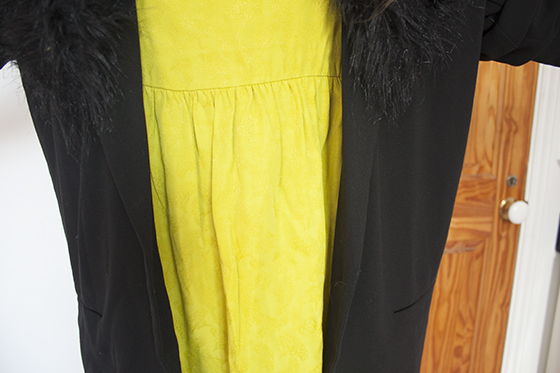 I know you wear a lot of darker colors, especially black, but you need to wear more bold colors, such as this yellow. It's gorgeous! Loving the posts, great style. That colour is B E A Utiful! Can't believe how good it looks! I like your jewellery here, I think turquoise looks amazing with yellow! I absolutely LOVE your hair in these photos. So strange to see you in such a bright colour! It looks amazing on you! I was a few clicks away to buying this dress. It's so lovely! But unfortunately I did not. But seeing on you, I just might purchase it for good!